If you’re travelling across Siberia west from the Pacific Ocean, or east from the Ural Mountains, your trip though Asian Russia should begin or end in Tobolsk. It’s hard to truly understand Siberia without a visit to the city of Tobolsk. Founded in 1587, Tobolsk was one of Russia’s first Asian outposts and later became the capital of Siberia. The city’s stone Kremlin, or walled citadel, is the only one of its kind in Siberia and rests on a bluff overlooking the windswept prairie of the Central Asian steppes. The easiest way to reach Tobolsk is flying to the city of Tyumen and taking the train. Direct flights run each day between Tyumen and Moscow or St. Petersburg ($450 roundtrip) and the city is just a four-hour train ride ($30-$80) from Tobolsk. Coming from the east, two Tobolsk-bound trains leave the city of Omsk on even-numbered days (oneway, $50-80). Today, the region around Tobolsk contains some of Russia’s largest oil and natural gas deposits. In October, 2013, the Tobolsk-Polymer complex, a new factory that will churn out an estimated 500,000 tons of polypropylene plastic each year, was built outside the city. Despite the surrounding industry, the beauty of the Tobolsk Kremlin rivals the far-more-visited Golden Ring towns outside Moscow and marks the point where Russia’s eastward expansion began. If you’re travelling across Siberia west from the Pacific Ocean, or east from the Ural Mountains, your trip though Asian Russia should begin or end in Tobolsk. Russian colonization of Siberia began in the 16th century under the reign of Tsar Ivan IV, often referred to as Ivan the Terrible. In 1552, Ivan’s forces seized control of Kazan, a city on the Volga River in Eastern Russia ruled by the Tatars, an Islamic people who still live throughout Russia. With Kazan behind them, the Russians slowly pushed east over the Ural Mountains and entered the flat steppes of Central Asia, a desolate land ruled by the Tatar khanate of Sibir who became Siberia’s namesake. Three decades after Kazan fell, Yermak Timofeyevich, an outlaw from the Volga region, led a small army of Cossacks on an ambitious campaign against the khanate of Sibir. In 1580, they took the modern-day Russian city of Tyumen from the Tatars. Two years later, the Sibir stronghold of Isker on the Tobol River fell to Yermak. In 1587, Russians established Tobolsk downstream from Isker at the confluence of the Irtysh and Tobol Rivers. The Hotel Georgievskaya (Ul. Lenekaya 35) is near the Tobolsk Kremlin and has luxury suites which cost just $110. Tobolsk became the capital of Siberia and later a way station for those exiled to remote corners of the Russian empire. In 1591, the Volga town of Uglich rebelled against the rule of Tsar Boris Gudonov. The short-lived uprising began by ringing Uglich’s church bell. Gudonov exiled the rebellious townspeople of Uglich to Siberia, and, because he considered the bell guilty, too, Gudonov sent it to Tobolsk. After the people of Uglich petitioned to bring their bell home, Tobolsk sent it back to Uglich in 1892. Tobolsk also received many famous prisoners over the years. Novelist Fyodor Dostoevsky spent a stint here on his way to a four-year sentence of hard labour in the nearby city of Omsk. Russia’s last Tsar Nicholas II and his family were sent to Tobolsk during the Russian Civil War. They were held captive in the city’s Governor’s Mansion and then transferred to nearby Yekaterinburg and summarily executed. Dmitri Mendeleev, the Russian chemist who designed the periodic table, was born in Tobolsk in 1834. Despite the city’s importance as Siberia’s former capital and Mendeleev’s birthplace, Tobolsk receives less visitors than other Siberian cities. The Trans-Siberian Railroad and the Russian Federal Highway—the main east-west road across Russia—both lay south of the city. But Tobolsk is still easily-accessible by train or car, and its beautiful old town is arguably Siberia’s finest. The Tobolsk Kremlin is the highlight of a walking tour around the city. 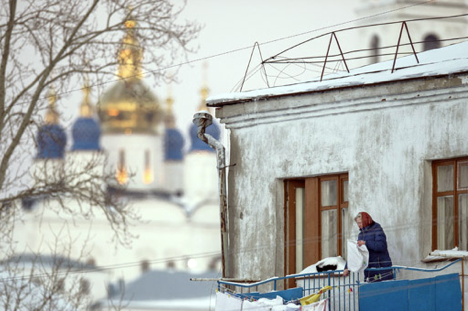 Located on a steep promontory above town, looming white walls with pointed towers on each corner surround the Kremlin. The centrepiece inside is the St. Sophia Cathedral. Constructed in 1686, this white edifice brims with golden and blue onion domes that overlook the Irtysh and Tobol Rivers where Yermak once clashed with the khanate of Sibir upstream. To the left of the St. Sophia Cathedral stands the bell tower that was constructed in 1799 especially for the Uglich bell and the Intercession Cathedral which contains impressive ceiling murals. The Tobolsk Kremlin is also home to a museum in its southern end with displays on the Tatar people and a replica of the infamous Uglich bell. Outside the Kremlin stop at the Deputy’s Palace to see the museum inside that documents Tobolsk’s days as the former capital of Siberia. The city’s old town lays below the Kremlin in the floodplain of the Irtysh River. It’s a great place to take a stroll past gray wooden houses with bright-colored carved window frames and imagine what the city looked like during the tsarist days. Not to miss in the old town are the Mendeleev Mansion (Ul. Mira 9) where the eminent chemist once lived and the adjacent Tobolsk Raion Administration Building (Ul. Mira 10) where the last Tsar Nicholas II and his family were kept. Upstairs there’s a small museum dedicated to the Tsar. For a sense of the region’s Tatar past, visit the mosque (Ul. Pushkina 27) and the Siberian-Tatar Cultural Centre (Ul. Yershova 30) which contains a museum and occasionally has performances on Tatar culture. If you’re traveling across Russia towards Moscow, connecting trains link Tobolsk with nearby Tyumen where the Trans-Siberian Railroad passes. If Tobolsk marks the beginning of your trip to Siberia, you can take a train east from here to the Siberian cities of Omsk or Novosibirsk. For a real adventure, head to the Tobolsk river terminal below the Kremlin. In the warmer months, ferries make the 3-4 day journey down the Irtysh River to Omsk and cost just $60 with a cabin.